Bob Wilson possessed one of the most distinctive and powerful voices in Boston sportscasting history. For 29 seasons, from 1964 through 1994, he was the radio voice of the Boston Bruins, including the famous call of Bobby Orr’s “flying goal” in the 1972 Stanley Cup Championship. Bob Wilson was born Robert Castellon in Stoneham, Massachusetts in 1929. He started in broadcasting as a Top 40 DJ job at WCOP/1150. In 1962, he joined WHDH/850 as a staff announcer. Two years later he joined play-by-play announcer Bill Harrington as color analyst for Boston Bruins games on WHDH. 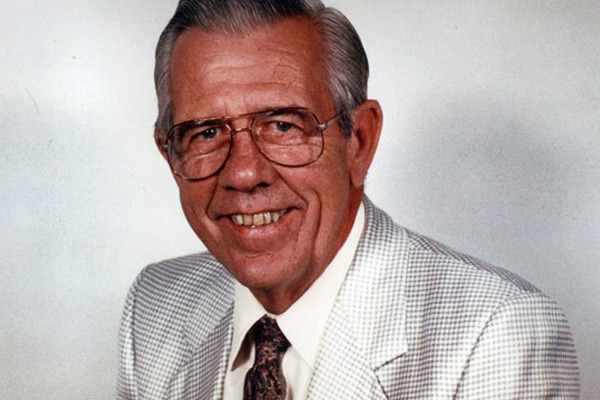 In 1967 Bob took over play-by-play duties for the next five years. Bob did the Bruins games on WBZ until 1978, when they moved at WITS/1510 for three years, then to WPLM-FM for nine years, then to WEEI/590 for four years. During this 23-year stretch Bob worked with many well-known color analysts including Bob Lobel, Glenn Ordway and Johnny Bucyk. The 1994-95 hockey season was shortened to only 48 games due to the NHL lockout from October to January over a player salary cap and lack of a collective bargaining agreement. Once the labor dispute was resolved Wilson chose to retire rather than undertake the grind of a compressed season. Bob Wilson’s booming voice was also heard for years on commercials for South Boston Savings Bank (“Alllwaays….the…Leeeeaderr!). Even in retirement, Bob couldn’t stay away from radio. He did part-time DJ work playing oldies at WKLZ/104.9 in Wolfboro, New Hampshire before hanging up his earphones for good. Bob was inducted into the Hockey Hall of Fame in 1987 and the Massachusetts Broadcasters Hall of Fame in 2007. He passed away in 2015 at the age of 85.